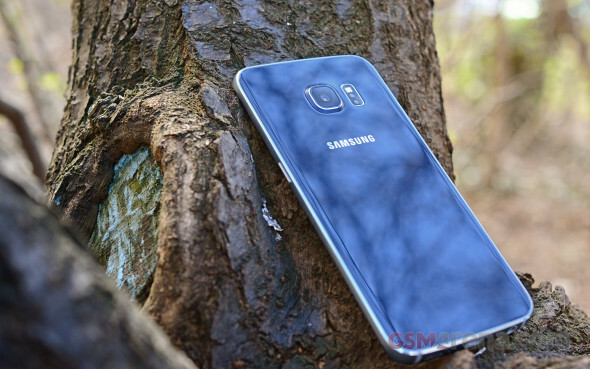 With the Samsung Galaxy S6 edge utilizes the same chipset as the standard S6 model - the in-house Exynos 7420. It's the first mobile chipset to be built on a 14nm fabrication process (Snapdragon 810 is on 20nm), which should reduce power usage. That in turn reduces the dreaded thermal throttling that was a major issue in the Exynos vs. Snapdragon debate recently. The Exynos 7420 and Snapdragon 810 are not that different in terms of processor, both use a big.LITTLE setup with four Cortex-A57 cores at 2.1GHz and four Cortex-A53 cores at 1.5GHz. The GPU is a Mali-T760 from ARM and it shares 3GB of RAM with the processor. With the Galaxy S6 edge we also got a retail unit of the Galaxy S6, so the benchmark scores in the charts below are taken all from the retail units of both devices. 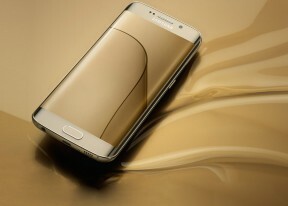 The Galaxy S6 edge runs a 64-bit version of Android 5.0.2 and all eight of its cores are 64-bit capable. This is good for the future, but for now 32-bit apps run just fine - in fact, AnTuTu 5 offered both options. Both S6 phones returned equal scores in both 32-bit and 64-bit modes, crushing the Snapdragon opposition (805 for the Nexus 6 and Galaxy Note 4, 810 for the LG G Flex2). The next compound test - BaseMark II 2.0, which gauges CPU, GPU, memory, system and browser performance, puts the Galaxy S6 duo at the top of the chart, on par with the LG G Flex 2, but way ahead of the competition, including the S810-powered HTC One M9. Looking at just the CPU performance at GeekBench 3, we see a massive advantage in multicore performance. The Snapdragon 810 runs its CPU cores a little slower (0.1GHz), but that's far too little to account for the difference. Basemark OS 2.0 confirms the multi-core difference, however, it puts individual core performance as similar to the Krait 450 cores in the Snapdragon 805. The Samsung Galaxy S6 edge the same screen as the S6 model, it just puts two curves around the edges. It's a QHD Super AMOLED screen - 1,440 x 2,560px - which is around 80% more pixels than a 1080p screen (like the LG G Flex2 and Moto X have). Offscreen tests normalize resolution at 1080p so you can compare raw performance, while on-screen tests predict real-world gaming performance. The Mali-T760MP8 (eight-core) is slightly faster in general than the Adreno 430 found in the curved LG phone and even the beefy PowerVR GX6450 in the Apple iPhone 6. Playable framerates at full resolution, however, are no-go for complicated 3D games so we're guessing game makers will stick to 1080p for now. Basemark X considers only off-screen results and quite expectedly puts Galaxy S6 and S6 edge way ahead of the competition. For general web browsing BrowserMark 2.1 puts the Samsung flagship lineup second best, topped only by Apple's iPhone 6 Plus (and far ahead of the rest) despite having to render pages at QHD while the iPhone screen is just 1080p. We also ran AndroBench - a popular storage benchmark, which gauges the read and write performance of sequential and random operations. Samsung promised the new UFC 2.0 storage in Galaxy S6 and S6 edge is 2.7x faster in random read than the one used on the Galaxy S5. We found it to be even better - the Galaxy S6 did 20000+ IOPS (input-output operations per second) at random read compared to 4800 IOPS of the Galaxy S5 on the same test. That's 3.25x times better. And before you ask, all tested devices were on Android Lollipop. Also all tests were ran with h/w encryption turned off - which is the default setting under Android Lollipop. The Samsung Galaxy S6 edge (and S6 for that matter) is the fastest mobile phone you can have at the moment and with 64-bit support in place this should remain the case for some time to come. The flagship offers top notch performance for any use case and may not be surpassed in 2015, looking at just the 5" size (obviously the Note 5 is coming and should be a bit faster).